No matter your passion, we have it all. 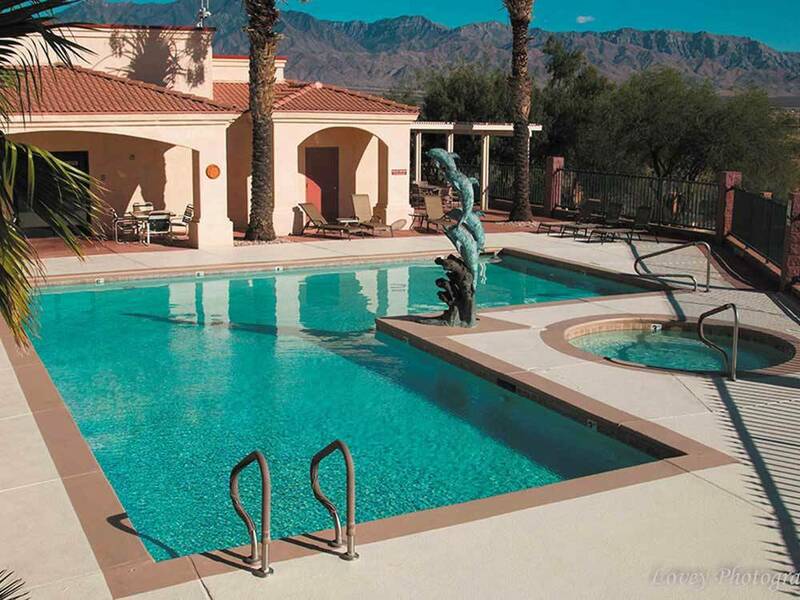 Relaxing by the pool & spa, off-roading, gambling, hiking, making new friends or golfing. 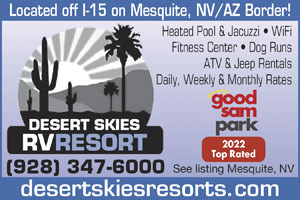 Located just off I-15 with free wifi we are the perfect stop for a night, a month, or a season. We stayed here just one night, just rocks and concrete, no trees no shade no grass. Not very pet friendly either, the dog run is hard to find, and it's just large rocks. We wouldn't stay here again. Easy to get to from Hwy. Wide turn to enter park. Nice pull thru gravel site with concrete pad for tow. Cable not available unless you go to cable company to get a box. 3 blurry channels on the antenna. WiFi not very fast. There is no Verizon phone or hot spot reception. Must drive up road to Nevada Visitors Center to get service.They say ATT is OK. More permanent park homes than RV's. Very bad Wi-Fi The Add said they have cable TV But what they don't tell you if your only staying a short time you have no cable and if you stay longer you have to go to the cable co. and get a box. The pull thru sites a fine. Good Elec, water. Sewer hookups in back. We paid in advance for a month. When we arrived we had no Verizon cell or hotspot service. I called the local dealer and he knew of the problem, but the owners of the park got very defensive and arrogant when I mentioned it. They know there is no service there, but do not tell you in advance. I went there to recreate and work, but could get any work done. Of course they have a no refund policy, which now I know why. The ladies in the office are very nice, but they are not permitted to tell people in advance of the lack of cell service. Poor Signage, hard to find, gps takes you to wrong street for entry, could be bad except a street takes you around to the one you came in on. Hosts could use some personality training. The park was new and nice, everything was great. Really hot and the power was sufficient for everything to operate and keep us cool.